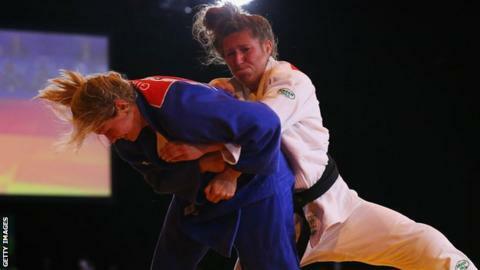 British judo rivals Natalie Powell and Gemma Gibbons will have to share a room before competing for Olympic selection. The World Judo Masters in Mexico is the final qualification event before Rio. Only one of the -78kg judoka can be selected, with Powell leading the qualifying race by 492 points. "Off the mat we get on as well as anybody in the team but I think it will be difficult in Mexico because we'll be sharing a room," Powell, from Beulah in Powys, told BBC Radio Wales Sport. "We're the only two [British] people competing on the last day and the rest of the team leave before we compete. So that's not ideal. "So they've put all the pressure on us in the last tournament. "We've shared a room plenty of times before so I'm sure it will be fine, but it's an odd situation to be in at the last qualification competition." Powell beat Gibbons to win gold at the Commonwealth Games in Glasgow in 2014, and beat her this year to claim bronze at the European Championships in Russia. The Masters, starting on 27 May, carries 700 qualifying points so Gibbons could overtake Powell - although the pair might not meet on the mat. "It comes down to this competition basically," added Powell. "This event carries the most points of the whole cycle. If she wins it and I didn't get a result then she would go, and basically I've just got to medal and do better than her then I'll be going."